Turn any outdoor space into a beautiful place for learning and play! 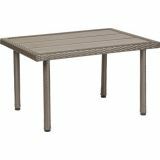 Weatherproof, water-resistant and fade-resistant, the Petite Patio Table is the perfect addition to any deck, garden or backyard. Little ones love having picnics and making art on the easy-to-clean tabletop. 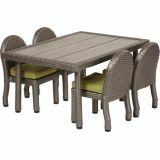 With a powder coated steel frame wrapped in durable hand-woven plastic that looks just like real wicker, this table is designed to stand up to the elements — and look great while doing so! 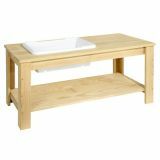 Made from attractive polywood, the low-maintenance tabletop resists fading, water and even bacteria growth. Use the adjustable feet to keep chairs stable on uneven surfaces. All-weather kids' furniture sets for creating a welcoming outdoor seating area! 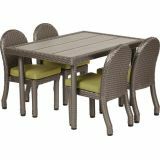 Weatherproof, water-resistant and fade-resistant, Petite Patio furniture pieces are the perfect addition to any deck, garden or backyard. Powder-coated steel frames are wrapped in durable hand-woven plastic that looks just like real wicker. 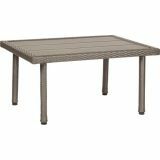 Sturdy tables with polywood tabletops are the perfect place for dining, block play, socializing, tea parties and more! Chairs and benches come with fast-drying cushions with 2" of plush foam and a removable cover. Use the adjustable feet to keep tables, chairs and benches stable on uneven surfaces. Sets available in different sizes to accommodate children of different ages and sizes. 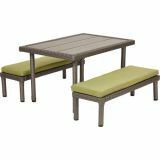 All-weather kids' furniture for creating a welcoming outdoor seating area! 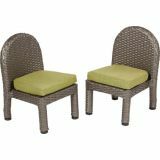 Weatherproof, water-resistant and fade-resistant, Petite Patio Chairs are the perfect addition to any deck, garden or backyard. 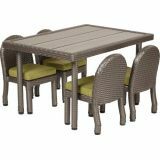 The powder coated steel frame is wrapped in durable hand-woven plastic that looks just like real wicker. Includes fast-drying cushions with 2" of plush foam and a removable cover. Use the adjustable feet to keep chairs stable on uneven surfaces. Available in three seat heights to accommodate different ages. 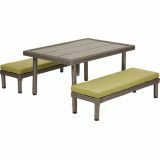 All-weather kids' furniture for creating a welcoming outdoor seating area! 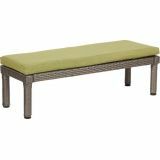 Weatherproof, water-resistant and fade-resistant, Petite Patio Benches are the perfect addition to any deck, garden or backyard. 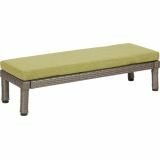 The powder coated steel frame is wrapped in durable hand-woven plastic that looks just like real wicker. Includes fast-drying cushions with 2" of plush foam and a removable cover. Use the adjustable feet to keep the bench stable on uneven surfaces. Available in two seat heights to accommodate different ages. 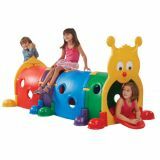 A colorful caterpillar featuring multiple sections for climbing, crawling and interaction. Body segments can be built in different ways or to fit in limited spaces. Brightly colored, blow-molded plastic is resistant to changes in temperature and fading by the sun. Easy to assemble–no tools required! 3-8.